I advised this mother to stop pureeing foods and stop spoon-feeding her little boy. Obviously until he masters how to use a spoon by himself and gets adept at picking up finger food, Mommy may have to spoon in a little baby food. But the goal should be self-feeding. Why is self-feeding so important? It refines and perfects hand-to-mouth motor skills. Being able to squish, play with, and manipulate food is a learning experience. Making messes is important at this stage of development. Plus he can soon catch up to the other kids in day care. Babies who self-feed are also less likely to be overweight than babies whose parents keep shoving it in. Babies are like baby birds that always open their beaks when Mommy Bird’s beak gets near. Spoon-fed babies are more likely to have problems knowing (and letting Mommy know) when they are full. In addition spooner babies tend to become more fussy eaters. You might be a fussy eater and spit out foods if somebody fed you and you had no choice. If the mother who asked this question switches from pureed baby food to finger foods and forgets the spoon until Baby can pick one up and direct food to his mouth, he becomes in charge of both his hands and his intake. There will be much less spitting out when the child puts the food in his own mouth than when Mommy does. Parents must avoid giving Baby choking foods like grapes and hot dogs. All really dense foods like meat must be cut in tiny pieces and put on the feeding table a few at a time so they don’t get all stuffed together in the mouth. There is a fashionable new trend in infant feeding called “baby-led weaning.” That term is used in this country to mean the baby is pretty much deciding when to give up the breast and switch to a cup. In Britain, however, this term means that Baby feeds his or her self all solid food from the get-go. No baby food, no pureeing, no spoon-feeding. 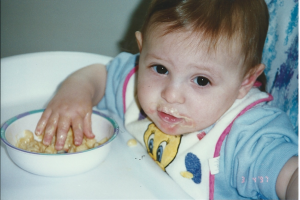 Spoon-feeding was a left-over relic from earlier feeding practices when pediatricians advocated starting solids at four-months before the hand-to-table-to-mouth movement was possible according to Julia Scirrotto in the New York Times who lives in London. She attended a workshop on this new trend in infant feeding. Baby-led-weaning is started when baby is about 6-months old, ready for solid food, can sit up, and has good hand-to-mouth control. Parents offer steamed carrot sticks, banana, and even skinned chicken drumsticks! This worked for Scirrotto’s daughter. Babies may gag or sputter but choking, provided “choke foods” are avoided, does not seem to be a problem. The biggest problem seems to be cleaning up the mess, at home or in restaurants! I used pureed baby food from about four months on but when the baby was comfortable sitting in the high chair I added what I have always called finger food: scrambled eggs, cottage cheese or cubes of cheese, fruit, small pieces of cooked vegetables, Cheerios, Jello. I also let the baby play with a filled spoon (sometimes the food got to the mouth!). By the time they were a year old, except for soup and other such stuff, my kids pretty much fed themselves. I expected and got a mess but knew this would help finger coordination. This entry was posted	on Friday, August 15th, 2014 at 8:42 pm	and is filed under Health and Safety. You can follow any responses to this entry through the RSS 2.0 feed. You can leave a response, or trackback from your own site.